I promised dog-rescue videos. Here are dog-rescue videos. Mostly these are beyond the more ususal “rescue group gets word of an abandoned pup” stories. These are dogs snatched from the jaws of death. A drowning girl is pulled from a well where she’s probably been trapped and swimming for hours. The expression on her face is unforgettable. 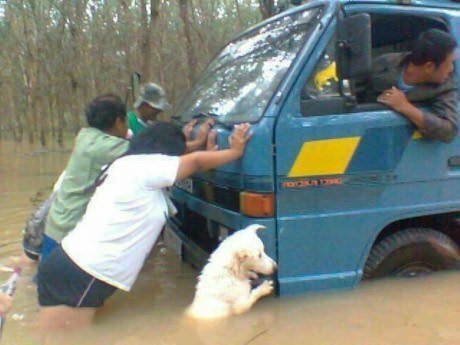 AWESOME men risk their own safety to save a dog who’s been valiantly trying, but failing, to save itself. Here are just a bunch of good people rescuing endangered dogs. Finally, because I always give short shrift to cats, here’s a story (non-video; lots of photos) about a starving, blind kitten who turn out to be one of life’s winning beauties. If those (except for that turncoat rat-dog) don’t give your faith in humanity a little upward nudge, I’m not sure what will. Now, after spending most of the day out of bed, I’m fading fast. I’ll probably be ready to return to reality in a few days, but right now (and all week) I’m having trouble even typing. So it’s offline for me and if you spot missing words, repeated words, or complete incoherencies, that’s just how it is when you’ve caught the plague. I’ve already caught about 20 of my goofs; I can do no more. Previous Post About that book contest …. Glad to see you’re feeling at least a little better Claire. Don’t do too much too soon. OT in that it’s not critters who get rescued, but it’s good in this mean world to know who we still are. It’s written by CMP PR, so grain of salt, but I’ve seen many similar stories with people of the gun. Cotton (your token cat) is very much like my female cat, Tilda. All-white, one green eye and one blue one. Former next-door neighbors had her. They first had her declawed on the front wheels, then decided she was a “feral cat” and turned her outside (I think they let her in the garage in very cold weather, otherwise she could not have survived.) I started feeding her whenever I saw her, which quickly became every time I was outdoors. Funny, for a “feral” cat, even when she was wolfing down food, she’d turn away from it any time I’d offer to pet her or pick her up. This went on for a while, and I was contemplating cat-napping her, when the alleged humans next door said they were about to move away. So I asked for the cat, which seemed to relieve them. I brought her indoors and put her through the veterinary “car wash” — exam, worming, shots, etc. — and she’s been a happy indoor cat ever since. The vet told me that with all-white cats with two eye colors, one eye typically doesn’t work. A simple exam-table experiment showed that she’s blind in the blue eye. He also said that her hearing is also likely to be one-sided, but that’s not so easily checked, so who knows? It’s a genetic defect, he says. I’m sure glad to have her. She’s super-cuddly, and often starts out her night next to me, using my upper arm as a pillow. A real sweetheart. A very efficient mouser, too, so her sensor suite must not be all that bad. Just please don’t go into the surf to rescue a dog without proper support. We lose enough people to sneaker waves each year in Nor Cal, it’s extra sad when they entered the water deliberately. Usually the dog makes it back on it’s own and one or two people die. It is a bad one this year. I couldn’t leave the bed for 4 days in November. Brutal. Sounds like the same bug.